This is a day that should live in digital history for two reasons. First is that the New York Public Library (NYPL) in Manhattan has released a large collection of digitized state and county atlas maps. The Burr’s Atlases and many of the individual County Atlases are able to be viewed online for free! Having only just now found them and testing only a few, they do leave you wanting more. The quality of the scans that I have checked so far is poor to fair at best, but they still are able to be used for reference as to locations. The individual homeowners names on the few that I checked were almost unreadable, but you should check them yourselves and maybe you will have better results. I for one would just like to give the NYPL credit for such forward thinking, and with thanks. Possibly the quality will improve. The second reason that this day shall remain famous is that this is the day that Mozilla wanted to set a world’s record with the most amount of downloads in one 24 hour period, upon the release of their new Firefox 3.0 browser that was to be available at 1:00pm today. For what it is worth, I have been hammering on that download site for three hours and have not been able to get in yet. The only time there was a connection it ended up being an error message about http: (something) not available. Looks like the new firefox is a little popular, even though you can’t download it. Searchme is a very nice new Search Engine. Searchme dot com is simple and easy to use, and displays scrolling images of webpages for search term. 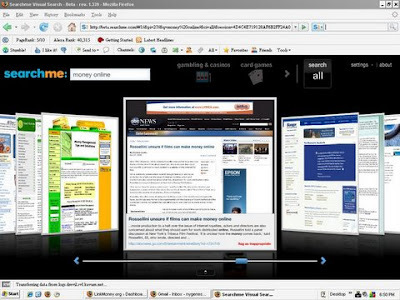 This is all FREE and there is a way to add Searchme to your Firefox browser search box, and from their about page, there is a way to enter your favorite website to be spidered, in case you did not find it yet. It is very nice to see comparisons of similar websites. The images scroll sideways similar to the way that the footnote browser does it. Searchme is still in Beta and not all websites are in their database yet, but it is growing all the time. My prediction is that this is going to become mega popular! Let us know what you think about Searchme, or footnote too, by leaving a comment at the end of this Blog post. Thanks to website http://LinkMoney.org for this information. ps: Tim Agazio at Genealogy Reviews Online also picked this story up and published it on his fine Blog. Check it out.